Turn with me to Psalms 91:1 “He that dwelleth in the secret place of the most High shall abide under the shadow of the Almighty.” Look at the additional handout that goes with this study. On that handout there are pictures of the tabernacle in the wilderness that the children of Israel carried with them for 40 years in the wilderness. It was made specifically to God’s instructions. It was assembled a certain way and taken down a certain way and carried a certain way. Wherever it was set up was sacred ground. There was the outer court where the people brought their sacrifice for their sins every year so their sins could be forgiven. Then there was the Holy Place and the holy of holies inside the temple where only the priest could enter. 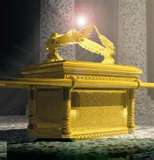 Inside the Holy of Holies was the Ark of the Covenant. The ark contained the Ten Commandments, Aaron’s rod that budded and a bowl of manna. It was overlaid with gold and very beautiful. 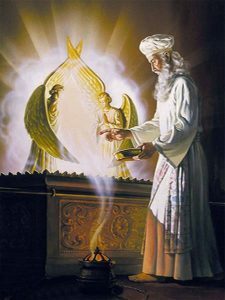 Angels with their wings touching were crafted on top and in between their wings was the mercy seat where the blood of the sacrifice was poured. It was on the mercy seat that the presence of God literally dwelled. This was their temple until the days of Solomon when he built the temple in Jerusalem. Every part of the tabernacle had great symbolic significance representative of Jesus and the sacrifice He would one day make. I have given you this brief background to take you back to that scripture we just read in Ps. 91:1, “He that dwelleth in the secret place of the most High shall abide under the shadow of the Almighty.” It is important that you understand the setting and what David was talking about when he wrote this. Imagine the temple set up in an open place. The sun would rise every morning and as it rose and as the sun passed over its course in the sky it cast its shadow. King David would sometimes rise early in the morning and wait for the sun to cast its shadow over the temple. And as the shadow was cast David bowed in its shadow over the temple. All the day long as the shadow moved David bowed and moved with the shadow until the sun went down, In the shadow of the Almighty. David had learned the secret to knowing the heart of God. David knew how to enter in to that secret place of God’s presence where it was only him and God. That secret place where no sin, no worry, no fear, no sickness, no devil could enter in to. There he would commune with God. There God would speak to David. There God would purge David of his sins. There is where David’s heart longed to constantly dwell. In His presence there was peace. In His presence there was life. In His presence there was understanding. In His presence was where all of life suddenly made sense. In His presence was where he would be equipped to fight and defeat his enemies. —Elijah crying out to God in a cave for God to speak, in 1 Kings 19:11-12, says: “And, behold, the LORD passed by, and a great and strong wind rent the mountains, and brake in pieces the rocks before the LORD; but the LORD was not in the wind: and after the wind an earthquake; but the LORD was not in the earthquake: 12And after the earthquake a fire; but the LORD was not in the fire: and after the fire a still small voice. —All through Isaiah chapter 9, (read this chapter on your own) He says over and over: “For all this his anger is not turned away, but his hand is stretched out still.” What a merciful God! Be Still and Know that He is God! Do you know it? The only way to know it and to have peace is know that He is with us. To know that He will never forsake us (Hebrews 13:5). How is this possible? Only one way: Get in His presence, don’t be in a hurry, abide under the shadow of the Almighty. In His secret place is where we must dwell. Dwell means we have to live there! We have to change our spiritual residence from this world and its circumstances and move in with God. We have to change the address of our thinking and move into what thus saith the Lord. It is going to take more than our 15 minute devotions in the morning, our quick Now-I-Lay-Me-Down-To-Sleep prayers, our yawning presence when we come to church when our minds are really on what’s on TV. Who’s light do you want to shine on you, God’s light or the TV light? It is going to take abiding under the shadow of the Almighty. God is not impressed with vain repetitions. What did Jesus say in Matthew 6:7: “But when ye pray, use not vain repetitions, as the heathen do: for they think that they shall be heard for their much speaking.” God knows your heart. 1 Samuel 16:7 says, “…for the LORD seeth not as man seeth; for man looketh on the outward appearance, but the LORD looketh on the heart.” There is a principle taught here that I want you to grasp. God looks upon the heart. God hears only what is coming from your heart. It doesn’t matter how eloquent you are when you pray, God is not impressed. He sees right through it. If what you are praying is from your heart He knows it. You might as well tell the truth, God knows if you aren’t. Even the most unlearned, backwoods, uneducated person around that prays from his heart has God’s attention as much as the most scholarly and learned among us, perhaps, in some cases, even more so. In these last days upon this Earth before the Lord returns we have got to get real before God. We need to just get in the presence of a Holy God and humble ourselves before Him. What does 2 Chronicles 7:14 say? “If my people, which are called by my name, shall humble themselves, and pray, and seek my face, and turn from their wicked ways; then will I hear from heaven, and will forgive their sin, and will heal their land.” Many church people love to quote that verse. They love to print it on T-shirts and church bulletins but I think most of them miss the whole meaning of this verse. First of all who is He speaking to in this verse? “If my people, which are called by my name”. He is not speaking to the world, He is speaking specifically to His people. At the time this was spoken He was speaking of Israel. The Christian of today is also God’s people. And then He goes on to tell them if they do 4 things: “humble themselves, pray, seek my face, and turn from their wicked ways;” THEN: He will ” hear from heaven, and will forgive their sin, and will heal their land.” Not before these 4 things are done will He do His part. Remember what Psalm 66:18 said?, “If I regard iniquity in my heart, the Lord will not hear me.” You can’t claim to be His child and still think you can live any way you want to. You must repent. You must be born again. Modern day Christianity has turned God into a vending machine, a Santa Claus! Yes, we can approach the throne of God boldly, but that doesn’t mean arrogantly, let’s read that verse about approaching God’s throne boldly. It is found in Hebrews 4:16 “Let us therefore come boldly unto the throne of grace, that we may obtain mercy, and find grace to help in time of need.” Why do we approach the throne boldly? “that we may obtain mercy, and find grace to help in time of need.” I don’t see anything there about arrogantly marching into God’s throne room and demanding our way! Isaiah had a vision of being in God’s presence once and how did he react? “Then said I, Woe is me! for I am undone; because I am a man of unclean lips, and I dwell in the midst of a people of unclean lips: for mine eyes have seen the King, the LORD of hosts.”(Isaiah 6:5). If we are going to get anywhere with God we have got to humble ourselves. We have got to learn how to pray. We have got to seek His face more than His hand (In other words, want Him more than just what He has to give.). We have got to repent. Paul said in 1 Corinthians 15:31: “I die daily.”, so even if we consider ourselves to be born again we would be wise to do as David did frequently when he prayed in Psalm 139:23-24, “ 23Search me, O God, and know my heart: try me, and know my thoughts: 24And see if there be any wicked way in me, and lead me in the way everlasting.” Then He will hear us from heaven. This is where true, effective prayer begins. This is not where it ends though. Oh no, there is so much more. So much more. He wants to take you so much deeper. He wants you to know how to battle and win against the demons that come against you. He wants you to know how to intercede for a loved one effectively. He wants you to know what it means to pray in the Spirit. He wants you to know how to vicariously enter into that loved one’s suffering and pray for them as they should pray if they knew how. He wants you to know what it means to pray without ceasing, persevering until it happens. …and so much more. I have told you how to begin. Apply these truths you have been taught thus far. Come and enter in…Learn more…Be with us the next study. Tell others and invite them to come. I can just about guarantee you have not heard it taught like this. Don’t miss the next study!